• The most common cause of hypokalemia is diuretic therapy. It is the most widely used antihypertensive medication, decreasing blood pressure through decrease of plasma volume by suppressing tubular reabsorption of sodium, and with chronic use, causes a reduction of peripheral vascular resistance. • Of the diuretics, the thiazides are the most widely used. • Used alone, diuretics control blood pressure in about 50% of patients and can be effectively combined with other agents - beta-blockers ,ACE inhibitors, angiotension II blockers. • Low potassium can be minimized or prevented by use of the diuretics in the lowest effective, a high potassium diet, limited salt intake or use of potassium-sparing diuretics, alone or in combination with thiazides. • Caution: Diuretics may increase uric acid and precipitate gout. • Excessive sweating and perspiration. • Metabolic acidosis, diabetic ketoacidosis. • Hypomagnesemia which may impair potassium correction. • Other disease states associated with high aldosterone levels that causes hypertension and excessive urinary loss of potassium. • ingestion of glycyrrhizin, which is contained in extract of licorice, found in supplements (see below), candies, etc. • Certain hereditary conditions: renal transport defects, hypokalemic periodic paralysis (muscular ion defect). Herbal supplements that may promote potassium depletion through diuretic or laxative mechanisms include aloe, caraway, castor oil, dandelion, elder flower, flaxseed, figwort, glycerol, licorice, peppermint oil, psyllium, wheat bran, and yarrow. A panel from the Institute of Medicine's Food and Nutrition Board has set the daily adequate intake of potassium for healthy adults at 4.7 g per day to lower blood pressure, counter the effects of salt, and reduce the risk of bone loss and development of kidney stones. 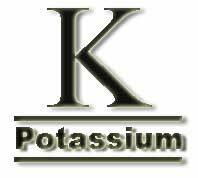 The amount corresponds to 10 servings of fruits, vegetables and other foods rich in potassium. Most American women aged 31-50 years consume no more than half the recommended amount of potassium, 2.2 to 2.4 g of potassium daily; and men's only slightly higher, 2.8-3.3 g daily. The panel found no evidence of chronic excess consumption of potassium. However, certain patients - those with renal conditions with impaired ability to excrete potassium, those on on potassium-sparing diuretics, and those on certain types of drug therapies such as ACE inhibitors - should be under the care of a physician, who may recommend a daily potassium consumption of less than 4.7 g per day. The largest meta-analysis so far conducted examining the impact of potassium intake on cardiovascular outcomes has found that higher dietary consumption of this mineral is associated with lower rates of stroke and could also reduce the risk of coronary heart disease (CHD) and total CVD. The senior author of this new research, Dr Pasquale Strazzullo (University of Naples Medical School, Italy) advises that rather than confuse patients with too much detail on nutrients and supplements, the simple advice woud be to eat more fruits and vegetables, particularli those that are very rich in potassium--including bananas, tomatoes, oranges, apricots, and most legumes. The most practical advice we can give is that people should have five or six servings of fruit and vegetables a day," he says. Alas, many doctors are not aware of what huge benefits one might derive from this measure.